MIG welding is an arc welding process in which a continuous solid wire electrode is fed through a welding gun and into the weld pool, joining the two base materials together. A shielding gas is also sent through the welding gun and protects the weld pool from contamination. In fact, MIG stands for "Metal Inert Gas." The technical name for it is "Gas Metal Arc Welding" (or GMAW), and the slang name for it is "wire welding". The MIG process enables the home-hobby, artist, farmer, motorsports enthusiast or DIY welder to make most types of fabrication and maintenance/repair welds. In addition to flexibility, many people turn to MIG welding because they've heard that it's an easy process to learn. Some claim it's "no harder to use than a glue gun." 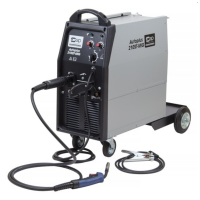 The SiP Autoplus 210ST-MIG Transformer Welder is powerful and robust, ..